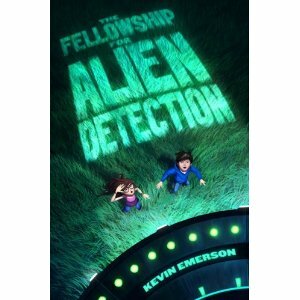 The Fellowship for Alien Detection by Kevin Emerson was on my Goodreads list in the spring and was excited to digging in. The title alone is so unique and begged me to find out what the “Fellowship” was all about. When I saw it in my local library, I snagged it quickly. The story follows two middle school kids who are preparing for a summer program for alien detection (hence the name). They were selected based on their theory/research on aliens and UFO’s. In addition, there is a side story about a girl who lives the town of Juliette, AZ. that appears to be trapped living the same day over and over (oooh, mystery). This book could be an episode of Teen X-Files – the truth is out there. I will not divulge too much of the plot in this review because I want you to read it without too many answers given to you. I think it will make this adventure more fun! Emerson has a great ability to draw the reader in and make them care about his characters right away. The internal dialogue and interactions with family members paints a clear picture of who these kids are and why they need to go on this incredible, and perilous, journey in search of truth. The pace of the action takes off in the second half of the book as the three stories are connected and the reader is clued in to the alien threat. Each of the kids grows up a little as they are faced with the dangers that come along with their discovery. The end of the book is very satisfying, but I felt there were a few spots that were out of place, including one paragraph that added nothing to the story. The door is left open for potential sequels and, given the strengths of this story, they should be a fun ride.